This new rule type is intended to be run manually since it's target is the message or conversation you select in your inbox. You can preselect the destination folder, or choose to be prompted at the time of execution to select the destination folder. A list of folders will be pre-populated and suggested based on your folder structure. You can configure 3 of your most important rules to execute with a single click from the main Outlook ribbon tab and on the message windows. This will provide the quickest path to these most important functions. This new feature allows the rule execution to run in a throttled fashion to improve performance within Outlook. Depending on the throttle setting (low to high), rules are executed in batches with a delay between batches until they are all executed. Custom time values for older than/newer than settings. Enter you own custom time values to use in rules when the out-of-the-box provided settings are not granular enough for your specific purposes. 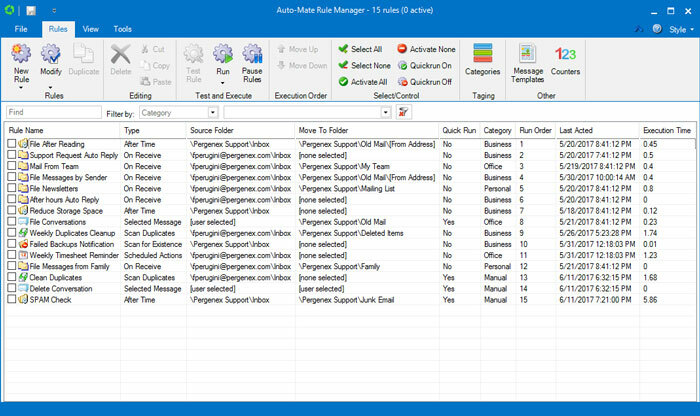 Keep you rules and setting safe by letting Auto-Mate perform automatic backups for you on a schedule that you select. Let Auto-Mate create your filing folders for you on-the-fly, now up to two levels. Speed, speed, speed!!! Major performance improvements loading rules and executing rules. Benchmarking tests against v9.0 show rule loading times faster by a factor of 10 times! Improved database reliability and protection from data corruption. Added "Not Complete" to flag condition. Execute rules only when I am not interacting with Outlook now considers activity in the preview pane. Update rule address fields directly from the Rule Test window. Enhancements to "Add Addresses To Rules" feature. Improved compatibility with Outlook 2016 32/64 bit and O365. Import your old rules from v3.x through v9.x.